Waterfront condos in Coral Gables range from luxury communities like the Gables Club and Deering Bay to smaller "low rise" condos primarily on Edgewater Drive. 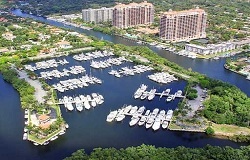 Many Coral Gables waterfront condos include private or community boat docks with "no bridges" access to Biscayne Bay. TIP: the number of waterfront condos in Coral Gables is somewhat limited. Let us know what you are looking for so you can be the first to know of new listings.